On the occasion of the new year 2017, His Holiness Patriarch Mor Ignatius Aphrem II invited their Excellencies the Ambassadors, Charge d’Affaires and Diplomatic Representatives to a Formal Reception at the Patriarchate in Bab Touma. 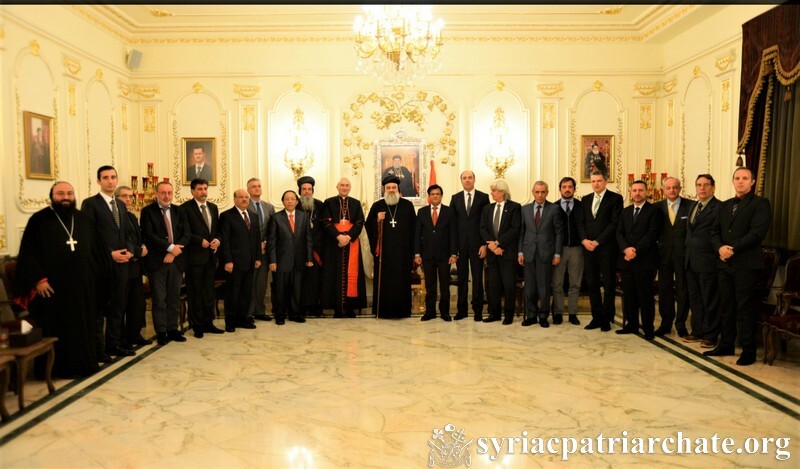 The reception was attended by their Excellencies: Mario Cardinal Zenari, Apostolic Nuncio in Damascus, and the ambassadors or heads of missions of the following countries: Algeria, Argentina, Armenia, Belarus, Bulgaria, Czech, Cuba, Egypt, India, Indonesia, Iraq, Norway, Palestine, Spain, Sudan and Sweden. His Holiness Patriarch Aphrem II welcomed their Excellencies and spoke about the current situation in Syria and expressed his confidence that terrorism and war cannot continue forever. He urged the international communities to support Syria and the Syrian people. He said that the hopes of the Syrian people are high that the new year 2017 will bring peace and that the situation in Syria will improve. He also observed that the improvement of the situation in Aleppo is a sign of a progress towards peace. He hoped that international cooperation in fighting terrorism could end the fanaticism and extremism that is witnessed in many countries throughout the world. Their Eminences Mor Timotheos Matta Al-Khoury, Patriarchal Vicar in the Patriarchal Archdiocese of Damascus, and Mor Yacoub Eduardo, Patriarchal Vicar in Central America, also attended the reception. This entry was posted in News and tagged Argentina, Cuba, Norway, Patriarchal Vicar, Syriac Orthodox Church by Orthodoxy Cognate PAGE. Bookmark the permalink.